A rain delay turned Tuesday's Yankees-Nationals contest into a suspended game. 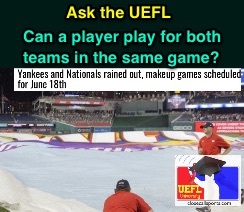 With the game not set to resume for another month, Ask the UEFL considers what would occur if New York or Washington added a player to the roster via trade or other transaction during that span. Eligible players ordinarily include those on the active roster, but what of those who weren't with a team when a game first began? Video: Do the rules address a mid-game trade? Could a player conceivably wind up playing for both teams during the same suspended game, or, rather, do the rules prohibit a player from appearing on both sides during the same game? Question: Are such new players—acquired via trade, call-up, coming off the Disabled List, or otherwise—eligible to participate in the second half of the suspended game or is the roster limited to only those who started play on Tuesday when the game was originally suspended? What if a player were serving a disciplinary-related punishment, such as a 50-day PED suspension, when the game first began? Answer: First, we find that the Yankees-Nats game is suspended because it was a regulation game (5+ innings) called with the score tied (3-3), as in Rule 7.02(a)(6). This player "not with the club" specifically refers to a player who did not appear on the 25-man active roster (or 40- in September), meaning that in addition to traded players, a club can use a player who has returned from the Disabled List, been called up from the minor leagues, or been moved from the 40- to the 25- active roster—as long as the team carries no more than 25 players (40 in September) on the roster in use for the resumption portion of the suspended game. 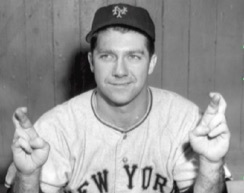 A suspended player, likewise, was "not with the club" in the sense that he was not in the clubhouse or eligible to participate when the game was suspended, even if he were still on the Major League squad serving his penalty. This ensures that a team which trades heavily or is subject to a Restocking Draft (pursuant to ML Rule 29, Major League Disaster Plan) is not placed at an unfair disadvantage upon resumption of a suspended game; for instance if a team had traded away half of its roster between the first and second halves of a suspended game, it will not lose the eligible-to-play roster spots that had been occupied by traded-away players. Picture This: A player who was taken out in the 3rd inning of what will eventually become a suspended game because that player had been traded to another team is then traded back to his original team months later. Can this player re-enter the game because he "was not with the club when the game was suspended" in a later inning? traded mid-game, but eBIS never verified it. Answer: Simply put, no. Rule 5.10(d) states that "a player once removed from a game shall not re-enter that game." A mid-game trade won't change that. 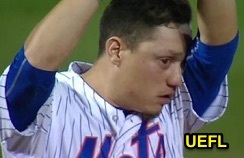 A longer explanation is that if the transaction was entered into the Electronic Baseball Information System (eBIS)—the same system through which other transactions such as drafts, minor league assignments, and Disabled List placements are effected—prior to the suspension of the game, then the player is said not to be with the club. The realistic nature of each transactions' detailed subtleties indicates that it simply takes time to dot the i's and cross the t's, and additional time for the League to cross-check certain eligibility criteria (no-trade clause? bonus? do the teams actually agree to the trade's terms?). Thus, the trade will not be official before the game becomes suspended, meaning, in addition to 5.10(d), this player will not be eligible to re-enter the game under 7.02(c). History: According to SABR archives, no player has appeared for both the winning and losing teams in a suspended game separated by a period of time, but it could have happened on several occasions. Hank Schenz nearly accomplished the feat. In 1945, outfielder Morrie Aderholt started on the Brooklyn Dodgers' roster as they played the Boston Braves on June 17, 1945, but Aderholt did not appear in this game, nor did he appear when the two clubs picked up the suspended game on August 4, when Aderholt was a member of the Braves squad. In 1951, infielder Hank Schenz appeared as a pinch runner for the Pittsburgh Pirates on June 17. After Schenz's appearance, the game was suspended and resumed on July 25, after Schenz had been sold to the opposing New York Giants; Schenz, however, did not play on the resumption date in July. In 1952, the Chicago White Sox and St. Louis Browns suspended their April 27 contest, resuming play on July 3. In June, the White Sox and Browns transacted four players—Leo Thomas, Tom Wright, Al Zarilla, and Willie Miranda—although none of these players appeared in both halves of the game. NBA players have appeared on both teams. Finally, Cardinals pitcher Dave Hamilton did not appear in either half of St. Louis' suspended game against the Pirates on April 23 and June 26, 1978. The feat has been accomplished, however, in the National Basketball Association, when Philadelphia's Harvey Catchings and Ralph Simpson, alongside New Jersey's Eric Money, played for their respective teams during a game that tipped off on November 8, 1978 and became suspended. 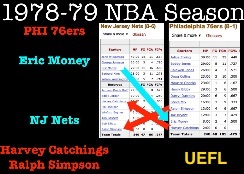 Following a February trade, all three players appeared for the opposing teams (Catchings and Simpson for the Nets; Money for Philly) when the game resumed on March 23, 1979.